1988－1990 Violinist in Parnassos String Quatet performed in The U.S.
1988－1996 Chamber Music Concerts in N.Y, Shanghai and Japan. 1996 Recital in Carnegie Weill Recital Hall and Tokyo Bunka Kaikann with Y.Kakeya(Pf.). 1996－2011 Many Recitals　in Japan and Colombia South America. 1988－1989 He performed Beethoven and Tchaikowsky Concerto in Nara, Japan with Orchestras in Nara prefecture. Formed “Parnassos String Quartet ”, and performed in the U.S.A.
Began to practice Jazz inspired by Kiyoto Fujiwara a famous Jazz basist. He joined The Paragon Rag Time Band under Rich Benjamin. and Harder Hall in Alfred university, N.Y.
1989－1993 Performed Chamber Music at Alfred Summer Chamber Music Institute in Alfred N.Y.
(With Joseph Fuchs, Mineko Yajima, Claire Chan Vn. Bob Dan Va. Dorothy Lawson Vc. 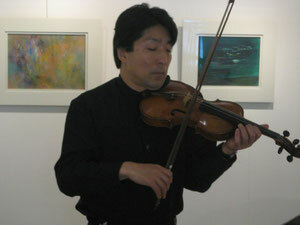 Gave Violin Recitals in Tokyo (Albert Lotto Pf.) and Nara (Tomomi Ohrui), Japan. Works of Brahms, Mozart, Bach etc. 1995 Gave Charity Concerts in Kobe, Japan after Hanshin Awaji Earth Quake. La Strada String Ensemble gave concerts in Kyoto, Osaka and Nara. Recital in New York (Carnegie Weill Recital Hall) and Tokyo (Bunka Kaikann) with Yuzo Kakeya (Pf.). Works of Beethoven, Prokofiev and etc. Invited to Taller Leon Simar in Cali Colombia as a faculty. Played Bach Violin Concerto No.1 A minor. (Orquesta de Taller Simar) in Sala Beethoven. He moved back to Japan. 1988－1994 Faculty of chamber music at Alfred University Summer Chamber Music Institute, Alfred N.Y.
A native of Nara, Japan. Tamaki Kanaseki lived in the US for 15 years after being accepted at the prestigious Juilliard School of Music in New York to study under the great violinist Joseph Fuchs whose assistant he later became. He has learned not only the violin technique, but also ensemble and chamber music, because of the linier tradition of Joseph Fuchs, whose education would go back to the time of Johannes Brahms, Joseph Joachim and Joseph Hellmesberger in the 19th.century. The great Hanshin earthquake of 1995 was the motivation for Kanaseki to return to Japan. Realizing the healing power of music for those who had lost everything in the disaster, in May 1996 he came back to perform charity concerts in Kobe to benefit the victims of the earthquake. Kanaseki’s solo recitals and chamber music concerts have thrilled audiences in the US, Japan, China and South America and he has performed concertos with orchestras such as the Osaka Philharmonic and Osaka Century Orchestra, the Jupiter Symphony in New York and Orquesta del Valle in Colombia. Numerous musical appearances on TV and Radio Shows include the NHK FM Recital. In 1993, Kanaseki formed the acclaimed string ensemble La Strada, which actively performs all over Japan.